Is it Spring yet? If you are looking for something new and fresh, we have it right here in the March 2019 issue of SGNScoops Magazine. The Old Paths are releasing their latest album this month, the first one with their current lineup, and we have all the latest news about this dedicated group of guys. Read all about Howard and Lou Hildreth as we have a tribute written by Marcie Gray. We were all so saddened to hear of Lou’s passing, as she has been such a bright light in the gospel music world. She has now joined her beloved husband at the throne of Jesus in Heaven and I’m sure her beautiful smile is even more radiant than it was here. Justin Gilmore takes us to a concert by the Tribute Quartet, while John Herndon updates us on the group Victory Road. Les Butler introduces us to his friend Roger Johnson of Heaven’s Mountain Band. I was happy to get acquainted with Jenna Faith, a new face in Christian Country. 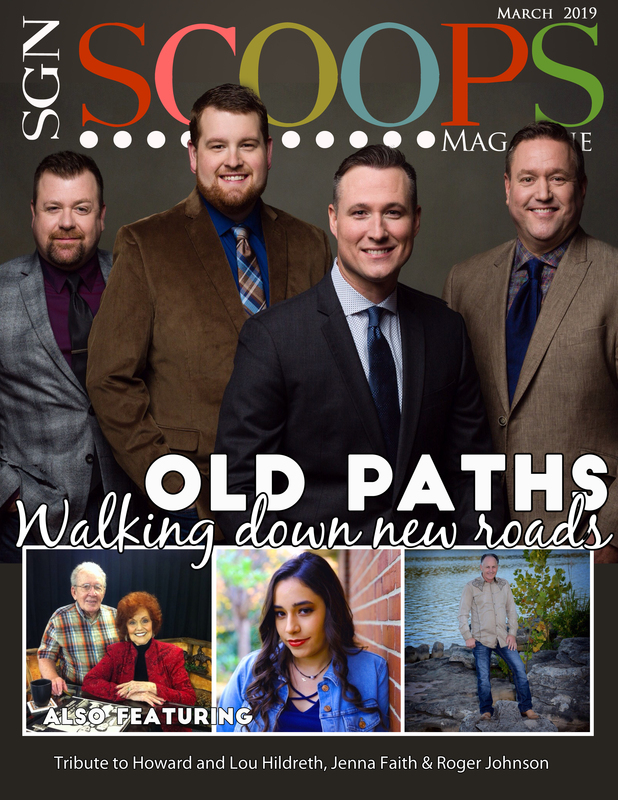 March is the month of the Southern Gospel Weekend in Oxford, Alabama, and we have all the information you need to know to attend on March 21-23. Suzanne Mason is back with Watch It film reviews and she talks about the documentary Social Animals, a must see especially for parents of teenagers. Don’t miss Vonda Armstrong’s DJ Spotlight with Greg Goodman, Randall Hamms’ new album reviews, all three radio charts, Rob Patz’s Publisher’s Point and the Editor’s Last Word. As always, if you have any comments or questions, please write to me at lorraine@sgnscoops.com. If you aren’t sure whether you will join the throng in Heaven when you pass from this world, be sure to write to me or anyone on staff. We will be happy to introduce you to Jesus Christ, Savior, Lord, God Almighty.